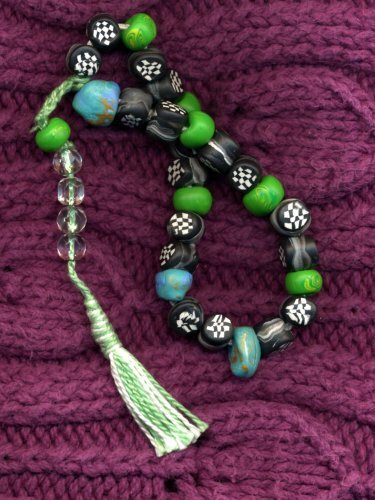 When I wrote my first post about prayer beads, almost three years ago, I considered buying a ready-made strand or a kit. I started out wanting sandalwood beads, but my budget was constrained, and it wasn’t as if my prayer beads were a necessity. Then I remembered a string of beads that were once my grandmother’s and had passed through a few family members’ hands before they came to me. Their string was literally on its last thread, so restringing them into a new form made sense. There were about 92 beads, and with the addition of some crystal beads that had been my mother’s as quarter markers, and a larger wooden bead I had on hand as the summit bead, they made a full mala of 108 beads. 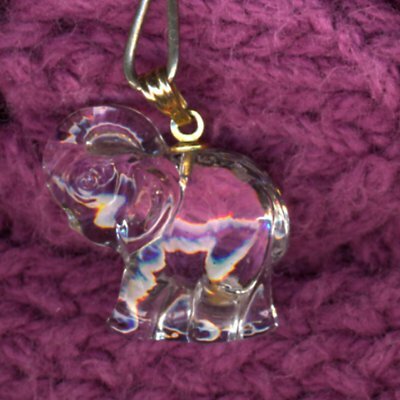 I added a crystal elephant I’d had for years, along with more crystal beads as counters. Ten counter beads may seem ambitious, but I wanted this string to fulfill any future goals I might have for working with mantras, prayers, or affirmations. After using this Job’s Tears strand for a few months, I began to wish for an additional strand half the length or less, for use anywhere that a long strand wasn’t convenient or practical. Additionally, the Job’s Tears hadn’t been easy to restring. I’d used nylon beading thread, which isn’t the most modern, durable material, and the original holes in the beads were small, not always straight, and sometimes difficult to get my needle and string through. Since Job’s Tears are essentially dried flower buds, they’re somewhat fragile and they split easily. In spite of that fragility, they’re also woody, and the little splinters inside tear and fray the thread a bit as it passes through them. Since I slide the beads over the thread as I count, the more I use them the sooner I’ll need to restring them. If they were Job’s Tears I’d purchased, that wouldn’t matter. They’d be cheap to replace if any get lost when the thread breaks. But these particular beads have sentimental value. Next time I’ll try a different thread, and maybe I’ll knot the strand — which I haven’t tried before with beads. Sanskrit mantra repetition has turned out to be a reliable sleep aid for me, as well as a good way to start the day, so I wanted a shorter strand I could keep by my bedside or carry in my purse. I decided on a half mala for my bedside table. Finally I remembered some beads I’d made when I was playing around with polymer clay a few years ago. I’d made a necklace to match a favorite outfit, but I’d stuck the rest of the beads away in a jar. I had enough beads already made up for two quarter-malas (27 beads each) and one half-mala (54 beads). One of the two quarter-malas didn’t turn out to my satisfaction, but I’m very happy with the other two, pictured below. I used more crystal beads as counters, and this time I attached them with a slipknot so I can remove them. That way I can wear the smaller strand as a bracelet without a counter dangling from it. These are strung with a doubled strand of sturdy, size 10 crochet cotton. My polymer clay beads are pretty unsophisticated, in fact rather primitive, with large holes, and even my fingerprints on some of them — so I guess I have to plead guilty that I made them. My favorite thing about them is the colors and shapes, which suit me just fine. Another advantage is that they don’t have splinters inside like Job’s Tears or sharp edges like some semi-precious stone beads, so they won’t wear the string out anytime soon. Of course there are more durable beading cords that can be purchased, but I’m still working with what I have on hand. I’m not sure polymer clay is the best material environmentally or energetically to use for prayer beads. Polymer clay is primarily PVC, which isn’t natural or biodegradable. But these beads have come in handy, and I don’t worry nearly as much about something happening to them as I do about my Job’s Tears, which carry sentimental value. I still use my Job’s Tears as well, because I love the natural feel of them in my hands. I’ve recently remembered another craft supply that I bought and squirreled away to try later. Creative Paperclay modeling material is reportedly made of natural, biodegradable, and completely non-toxic materials. It can be fashioned into shapes and, once dry, it can be painted with water-soluble paint, sanded — basically treated like softwood — and then varnished or lacquered to protect the finished piece. I could even omit the varnish and let my Creative Paperclay beads gradually return to nature. So my next prayer bead goal is to make beads out of Creative Paperclay and experiment with including ground dried rose buds, as a bow to the original rosaries, which were so named, according to some sources, because they were made from rose petals. 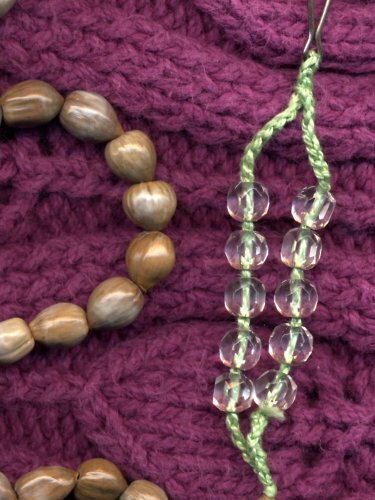 If you’re not interested in working with beads, but you count knot tying among your skills, you might want to consider making your own knotted prayer rope out of cord, following these instructions: How to tie an Orthodox Prayer Rope knot. 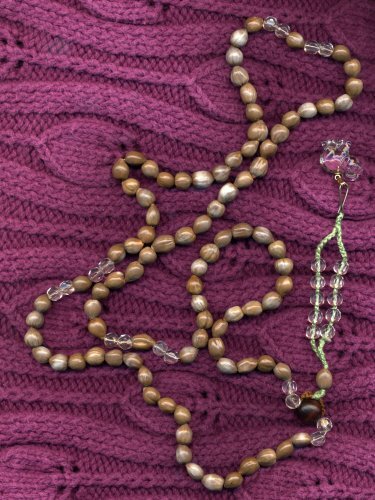 Perhaps the most comprehensive and well-researched site I’ve found on prayer beads is Karen’s Prayer Beads, where Karen Deal Robinson covers many different traditions, how and why she designed her personal strings of prayer beads, and ideas about how to use them, including her own versions of some prayers. Thomas Ashley-Farrand’s focus is primarily on Hindu mantras, but Healing Mantras includes a few from other traditions as well. I also own a book titled Meditation , by the late Eknath Easwaran, and several of his other titles are on my wish list. I recommend his writings for helpful information and instruction in meditation and mantra use, provided from an Eastern perspective (he was Indian by birth) translated for Westerners. I find that repeating certain of these ancient mantras helps me gain peace and center myself. I try to select those that suit my individual needs. There are Sanskrit mantras for protection, for improving relationships, for healing, to enhance creativity or abundance, and for simple devotional practice. In a sense Sanskrit mantras have provided me a “reset button” for my brain, helping me to silence all the negative and cluttered thought patterns that modern life seems to burden us with. If your interest is primarily in Buddhist mantras (also traditionally written or recited in Sanskrit), the most commonly used and most well-known one is Om Mani Padme Hum, with the Green Tara Mantra coming a close second: Om Tara Tuttare Ture Swaha. A search for either, enclosed in quotes, will lead you to numerous sites discussing their use. I’ll share just a few here. Tibetans pronounce the Sanskrit words a little differently than Buddhists from other places, and the first link below includes an amusing story about “correct” pronunciation. You don’t have to be a Hindu or Buddhist — I’m neither — to benefit from Sanskrit mantra practice or meditation. Neither do you have to be a Catholic — I’m also not — to pray the Rosary. 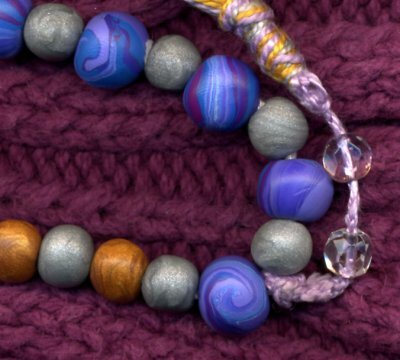 In fact, you don’t have to be spiritual or religious at all to use beads for repetition, affirmation, and focus. Someone who’s uncomfortable with any form of spiritual practice still might find strings of beautiful beads helpful for centering practice or for repeating affirmations to help improve their quality of life. I could probably keep adding more, because this topic obviously fascinates me and I love to read about it. But if you’ve gotten this far and you still want to know more, I’m sure you’ll find your way to what you need on your own. If you decide to make or buy prayer beads and use them, I hope they provide for you the same peace and healing balm they have for me. Great article Barbara, myself and a few others in my meditation class have really enjoyed, thank you! Super article, Barbara…I have been attracted to prayer beads for as long as I can remember. For whatever reason, I never thought of making my own. Thanks also for the great links..Om Mani Padme Hum being one of my favourites. Have you ever tried other crystal types as beads? Example would be obsidian, jasper or amber/copal. These make good material for beads, as are tumbled polished quartz. got? Mine would never capture this detail. What a great post. Bev, thanks. I do have a fairly good digital camera, but these pictures were made on my scanner. (Epson Perfection 1640SU about eight years old.) 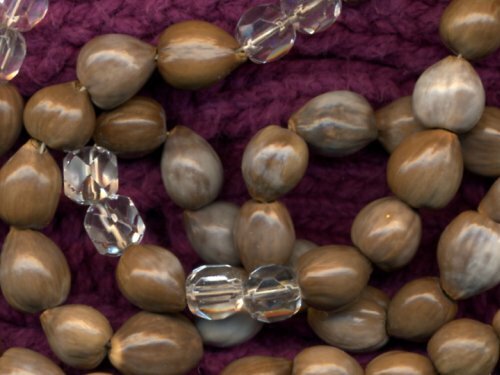 I arranged the beads on the scanner bed and covered them with a sweater. If you’re looking for a good camera, I like my Canon Power Shot G2 fairly well, but it’s about 6 years old. I’m sure there are better ones available now, and possibly for a much better price, since the technology was newer then. I spent an arm and a leg on mine and sometimes wished I’d waited for the newer ones and a lower price. I am happy I opted for some add-on lenses at the time, because they make it more versatile when I want close detail — though I didn’t even play around with the closeup lens until just today. I wish I had sooner. It gave me some really good pics of some tiny flowers this morning. I had no idea that you could put anything but flat objects on a scanner. Those scans came out extremely good. I am just thinking of all the things I could have done in the past with a scanner that way that I used a camera and macro lens. The scanner would have been so much easier. I love the beads by the way, I just got a little exited about the scanning thing. Thanks for the tip. 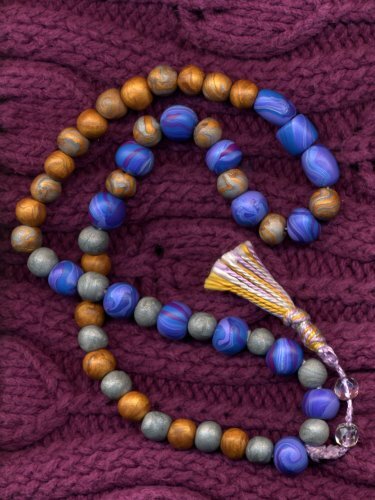 I have practiced iyenga yoga for 13 years and Combined with Medititation, this has helped to serve me for a better understanding of Me, the use of Meditation Beads does interest me as never really used them before, Will give them a try on my next Meditation.